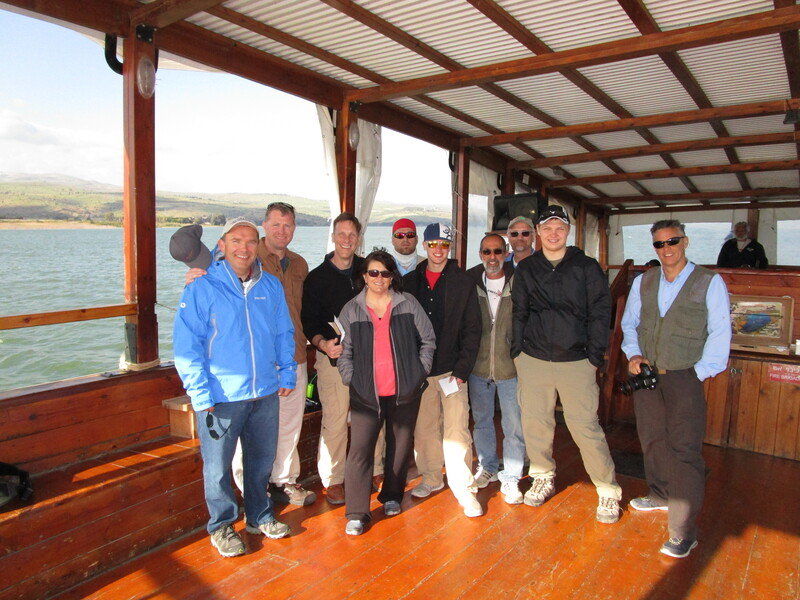 We took a boat out on the Sea of Galilee today. (I know, pinch me!) Because I am not a strong swimmer, I must confess that I’m not altogether comfortable on water. I was a little nervous about it ahead of time, not knowing what kind of boat we would be in or what the weather would be like. 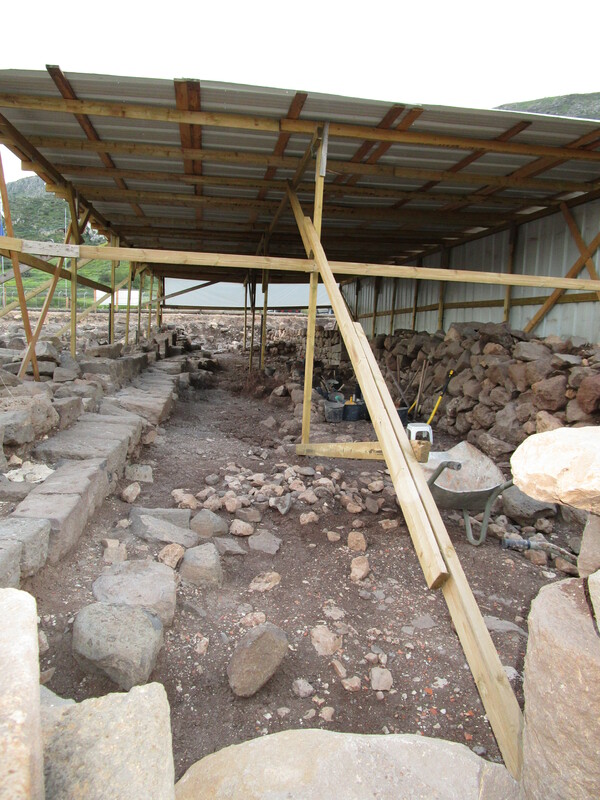 I’m determined not to be a “girl” about any of our group plans (but the jury’s still out on Hezekiah’s Tunnel…) even though I am the only girl. I also must confess that I even took a Dramamine. It turned out to be a boat large and steady enough to hold 30 or 40 people, the weather was clear, and my fears were unfounded. 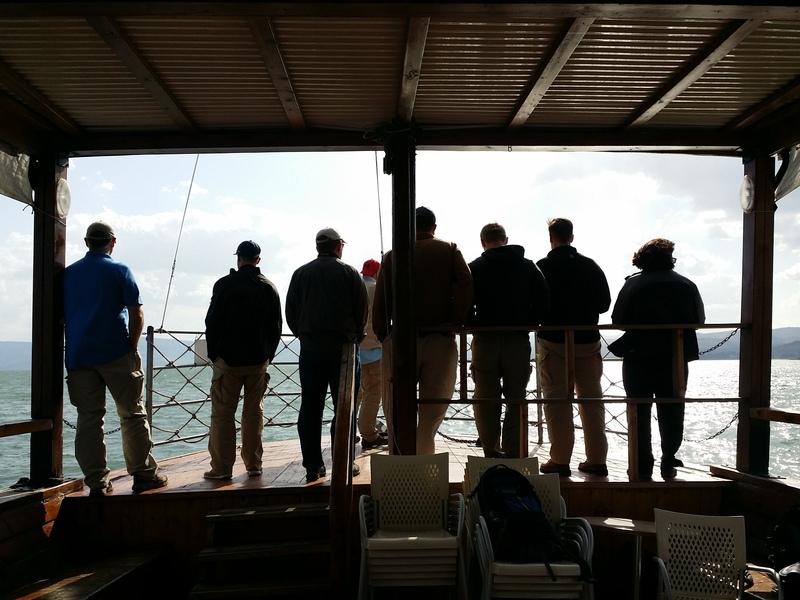 And as we stood on the bow and sang “Master, the Tempest is Raging” I thought about my own lack of faith (not just about a little boat ride, but about larger issues in my life) and compared it to that of Jesus’ apostles. I’ve often wondered how it was possible that those who lived with and worked alongside Him – and SAW His great power and love from day to day – were still astonished, even fearful, when He showed His great power. But I’m the same way. I live and work alongside Him every day. I know His great power and love, but things beyond my control scare me – just as things beyond their control frightened His disciples. And I wonder, why am I still afraid? Have I still no faith? Instead of being fearful like the disciples, I want to be strong and courageous and full of faith like Joshua, because I know He is with me wherever I go. “…Be strong and courageous. Do not fear or be in dread of them, for it is the Lord your God who goes with you. He will not leave you or forsake you,” (Deut. 31:6). 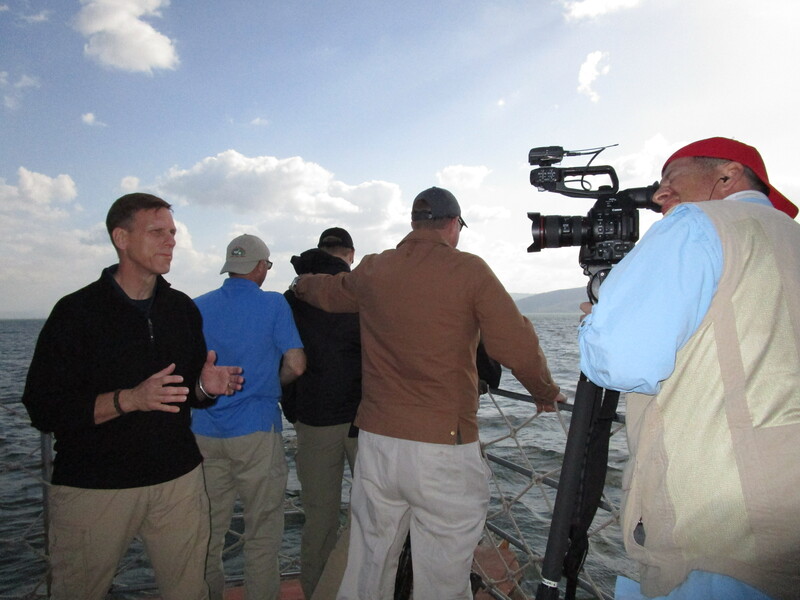 Singing on the bow of the boat on the Sea of Galilee. Another full day and another long post! 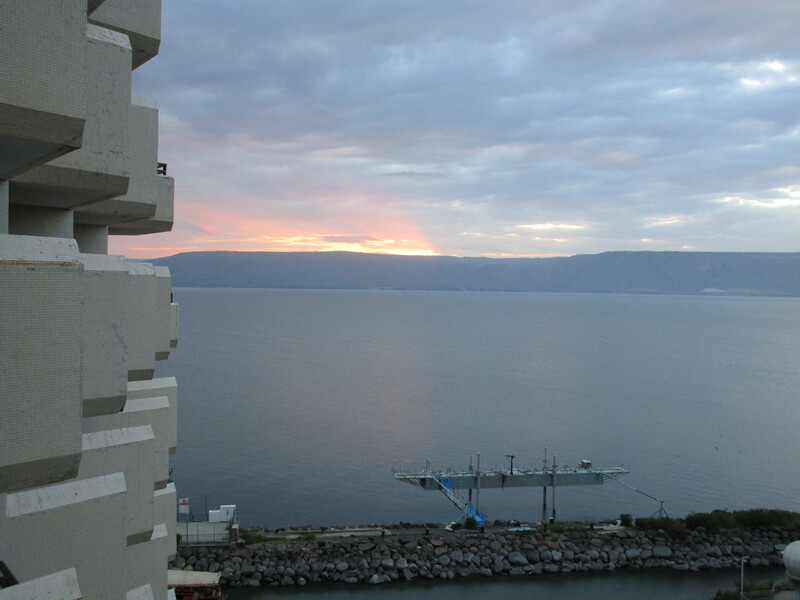 We are all fine, and we are in Tiberius on the Sea of Galilee – you can stop reading if that’s all you need to know! On the bus by 7:30 with a devotional to start our day, and we took off for Mt. 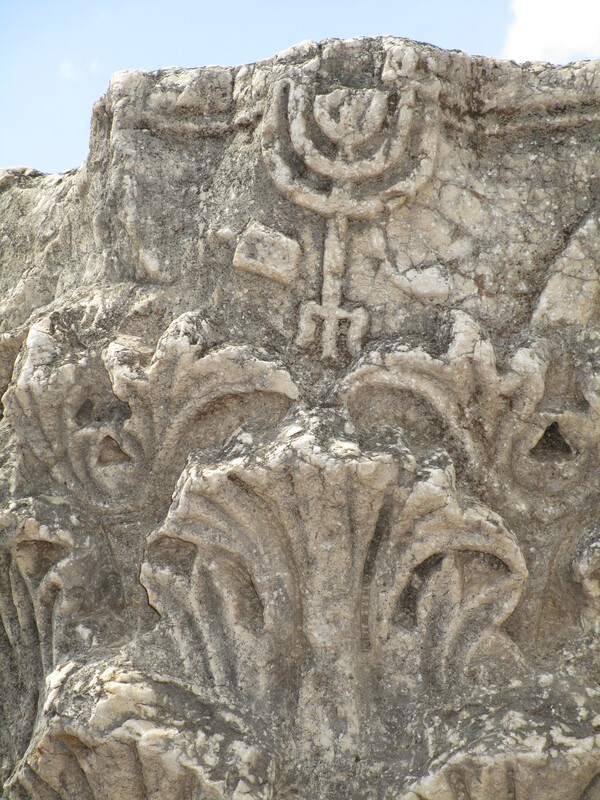 Arbel. 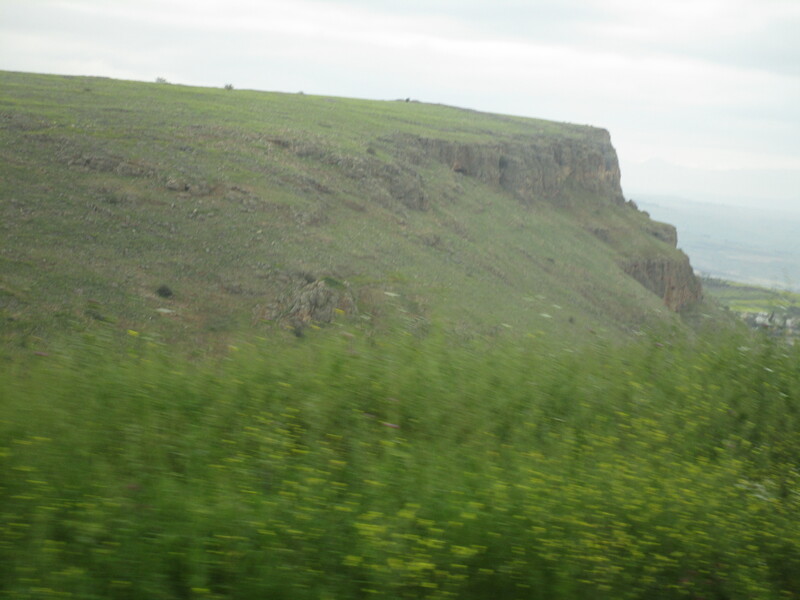 It is an imposing mountain situated on the northern end of the Sea of Galilee, with a sheer rock drop-off where it faces the sea. 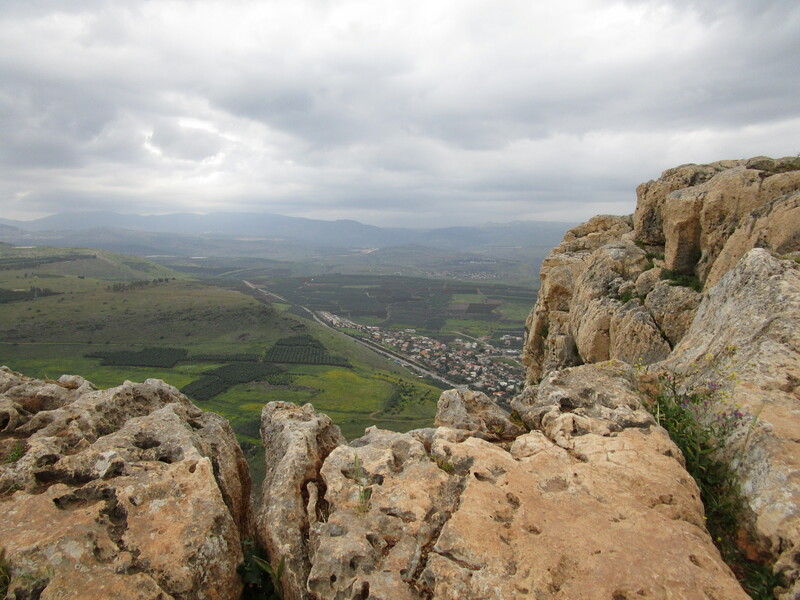 We went around the “Horns of Hittim” where Tsvi told us that Saladin won victory over the Crusaders by setting fire to the field. Since the Crusaders were wearing metal armor, they were basically burned to death…and this is when control was turned to the Muslims. The drive was another curving road with plenty of switchbacks and scary (to me, the girl) twists and turns, but more breathtaking views. 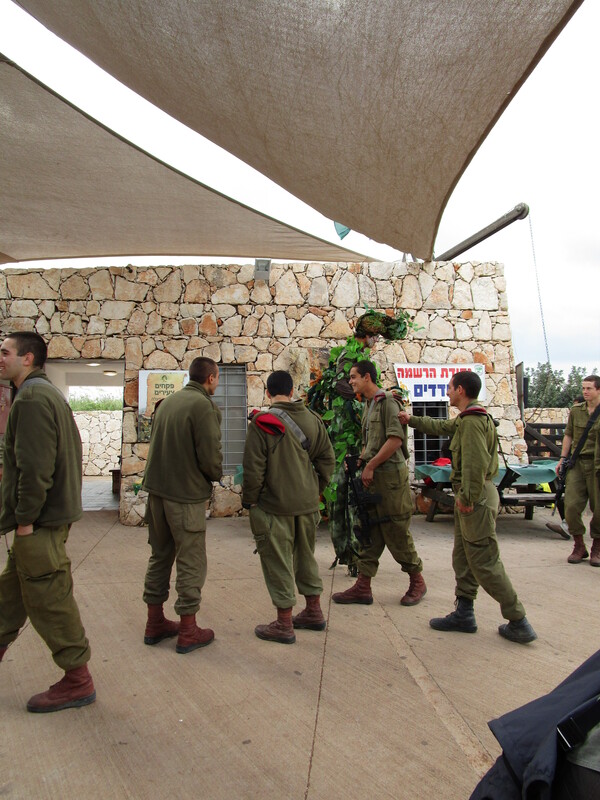 When we approached the top, there was a roadblock, and after conferring with the guards, Tsvi told us that we only had 20 minutes, as an Israeli army march was planned for a fallen soldier. The longer-legged men were soon ahead of me so I tried jogging up the trail. Jogging + up doesn’t work for me. 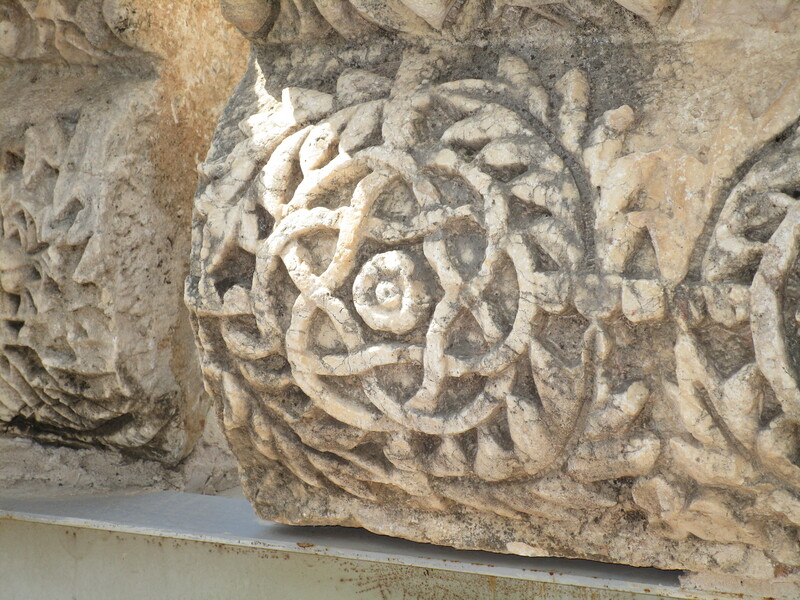 I stopped and snapped some photos along the way to share (and maybe to take a breather.) At the top I found all of the guys discussing where cities were located along the shoreline. Mat was perched on a big rock not far from the edge, and I had to look the other way since heights make me nervous (girl again.) But he got some beautiful footage of the coastline. 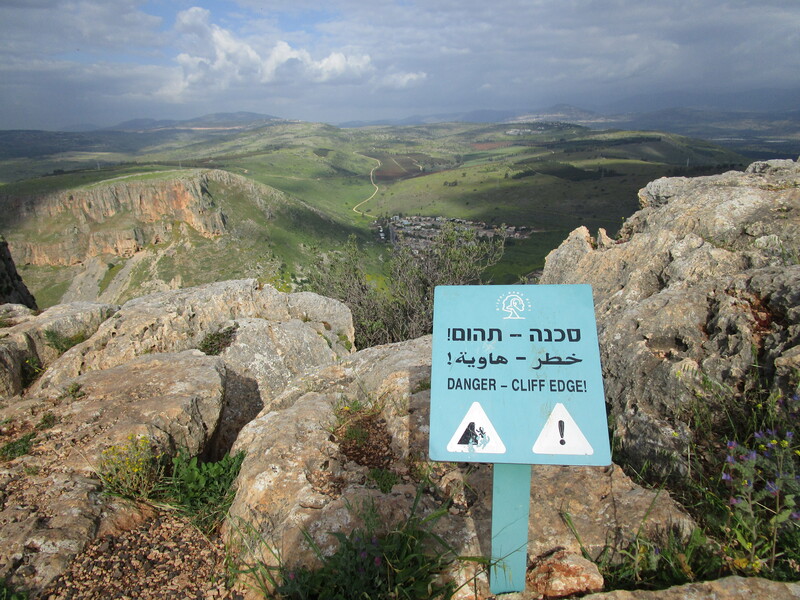 We headed down the mountain, and as we arrived back at the entrance, the place was running over with Israeli soldiers carrying machine guns. They didn’t look much older than Philip and Micah. I would have expected most of them to be dark-skinned, but most of them were fair-skinned. 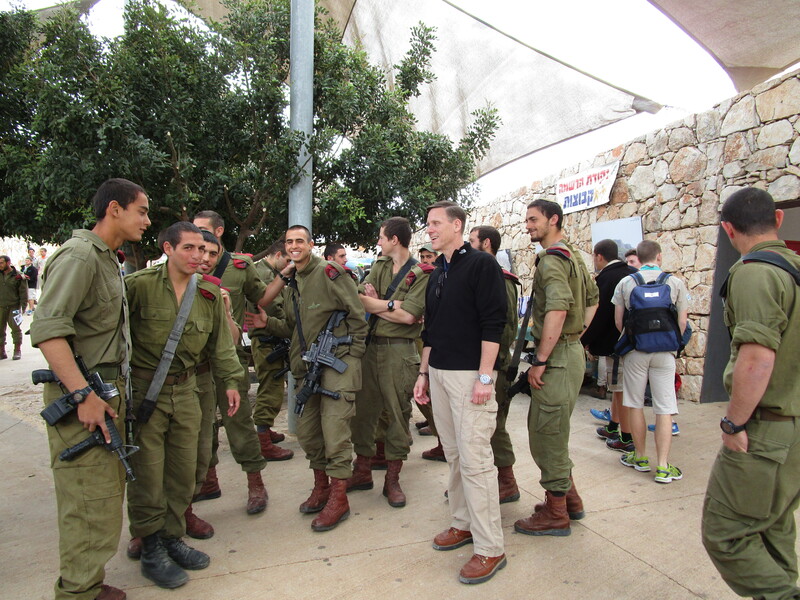 They were smiling and agreeable – John even managed to get a picture with a few of them – but STILL, a big group of teenage boys carrying machine guns is not something you see every day! And hearing Elton John’s “Your Song” piped over the loudspeaker at Mt. 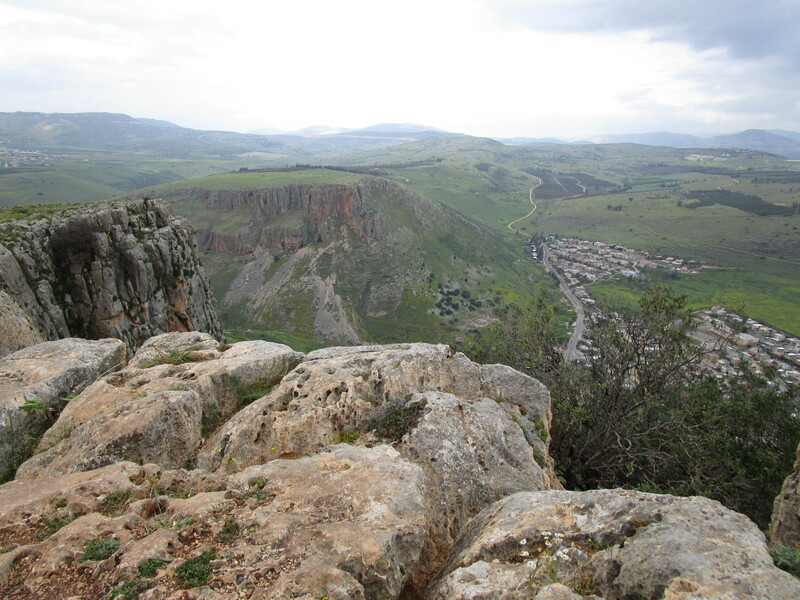 Arbel during an Israeli Army march is not something you hear every day, either! 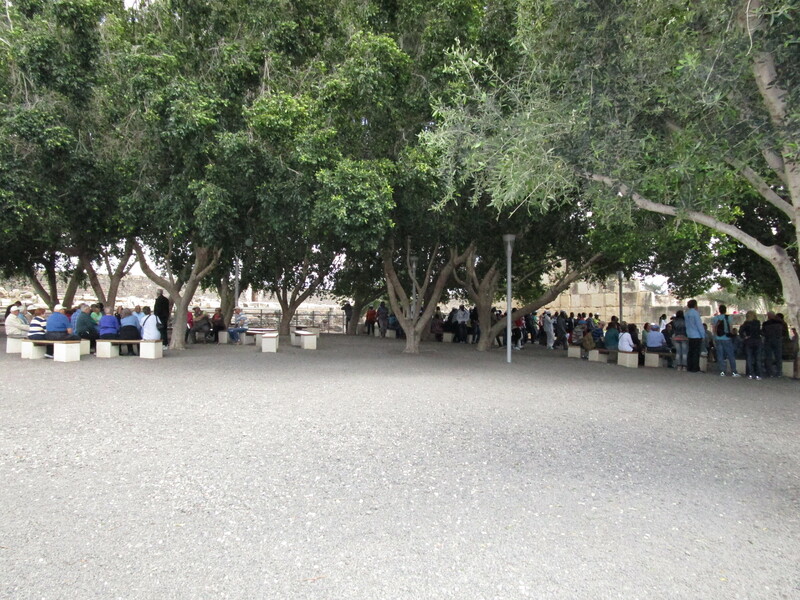 Our next stop was a lovely, beautifully landscaped church building called the “Church of Beatitudes”. Run and maintained by “tough” (as Tsvi told us) Franciscan nuns, Mat was worried they would not let us film inside the church, and Rick wanted some B-roll from the inside. We were met at the door by a tiny, bent, wrinkled nun with twinkly blue eyes and a bright smile behind her pointed index finger at her lips (the universal gesture for “shhh!”) Jon charmed her into letting us in with the video camera, and Rick got the footage he wanted. 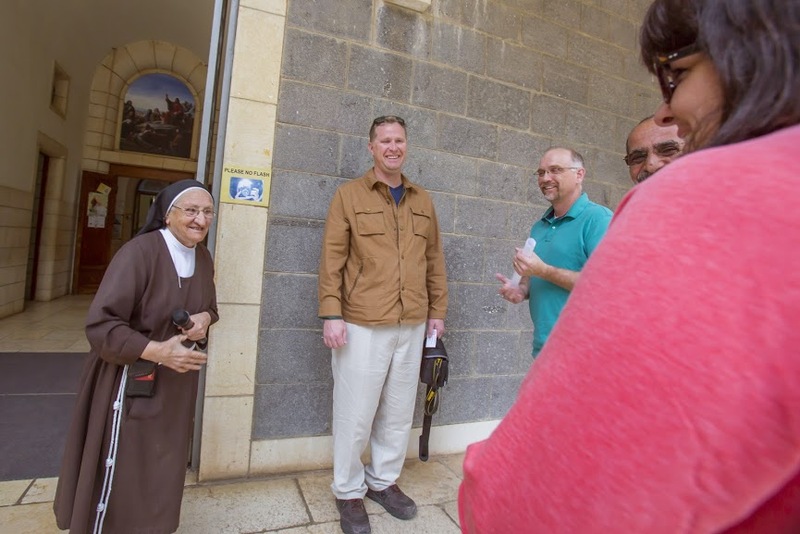 The interior has amazing acoustics, and singing is allowed, so we stepped in for a moment and sang “The Lord’s My Shepherd” – and sounded great if I do say so myself! 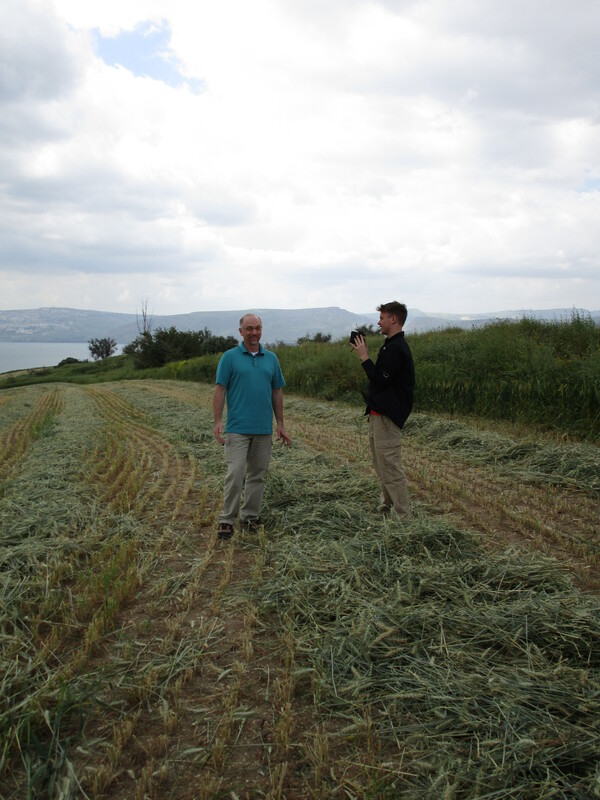 Rick had some A-roll he wanted filmed, but he wanted the Sea of Galilee to be in the background, so we hiked down an embankment (and probably trespassed) into a field with mown hay. Rick had his lines down and we were on our way again! One thing I am sad about is the fact that the “Cove of the Sower” that John has shown pictures of and talked so much about is now a banana plantation. 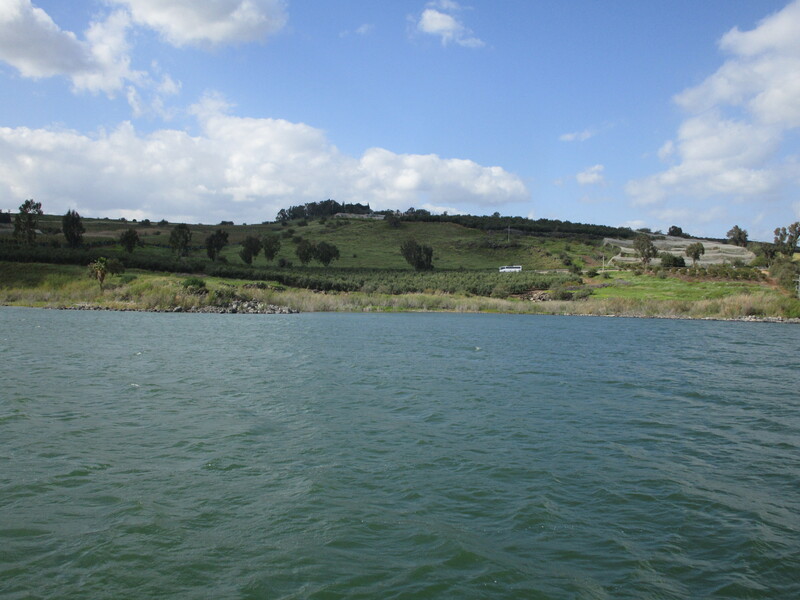 This site is traditionally believed to be where Jesus spoke to the crowd from a boat offshore. The land forms a natural amphitheater and voices from the water carry for several hundred yards up the shoreline. 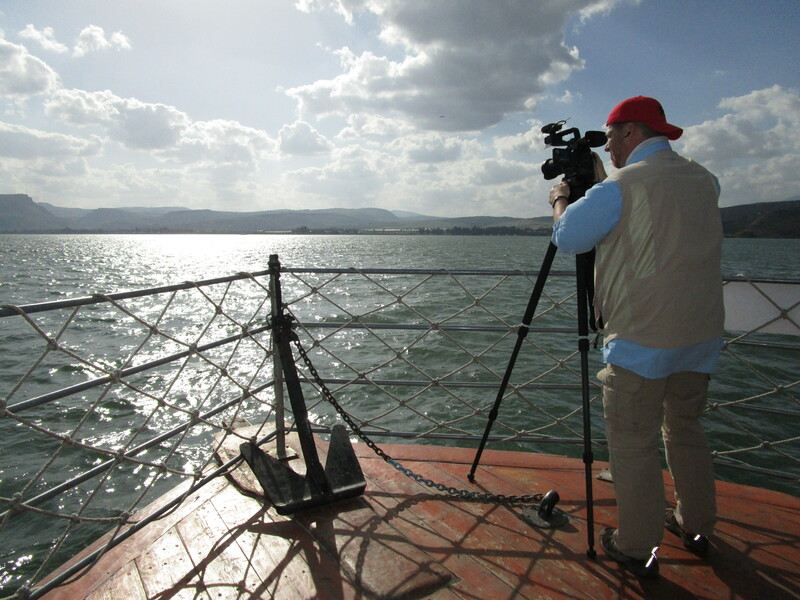 I wanted to sit 100 yards away from the water and hear what those in the first century may have heard. 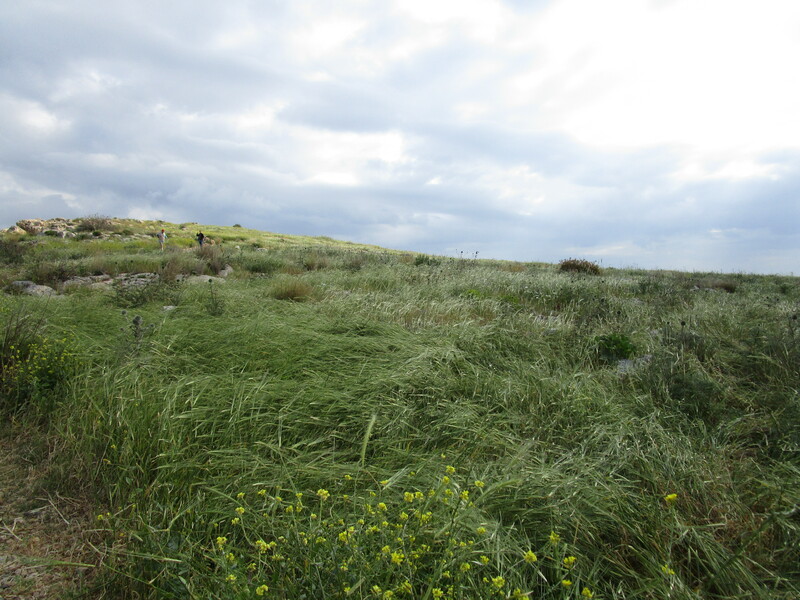 I know the land can’t be untouched – growth and change happen, but do they have to happen here? 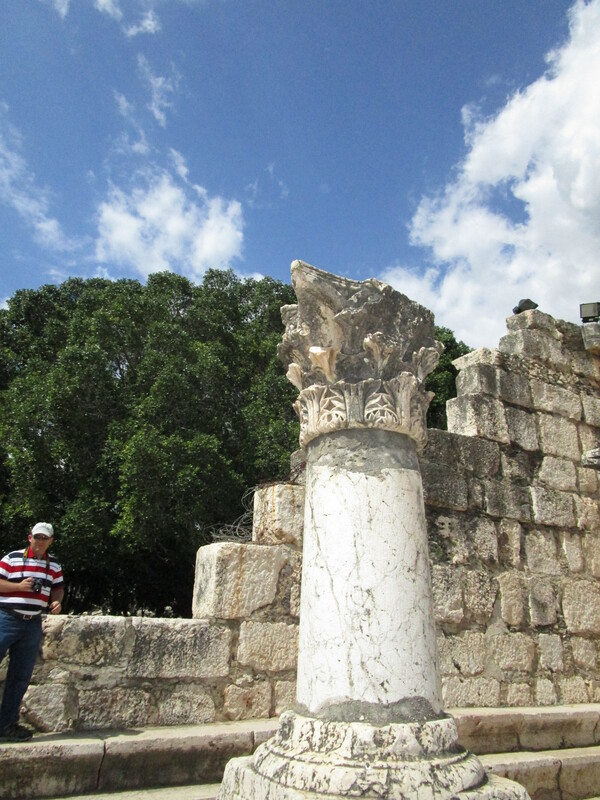 We moved on to the village of Capernaum, which Jesus had made His home after leaving Nazareth. 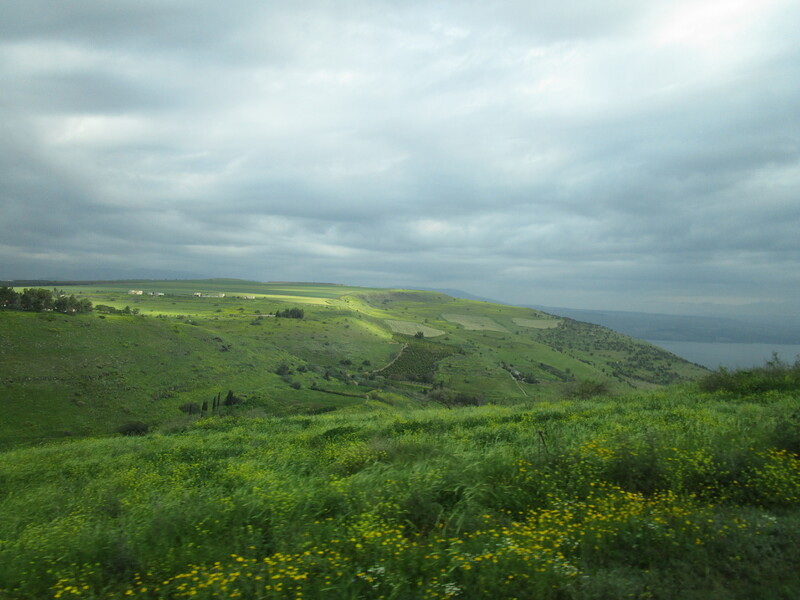 Matthew 8 tells of the Roman Centurion who met Jesus as He entered Capernaum and begged Jesus to heal his servant. 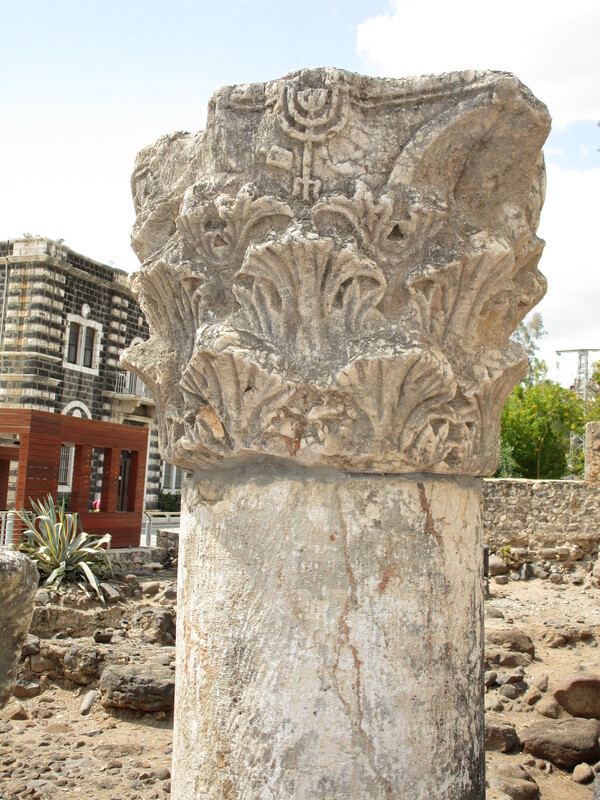 Capernaum is where the Bible records Jesus entering the synagogue, and those present were astonished at his authoritative teaching. 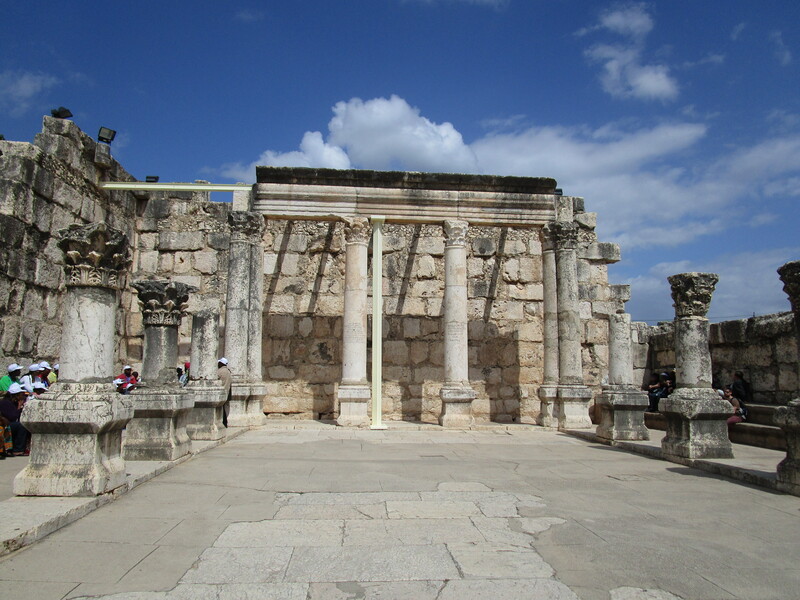 Capernaum is where four men carried a paralyzed man to a home where Jesus was, to be healed by Him, and found the house so full that they resorted to climbing on the roof, and removing it in order to lower the man to Jesus below. 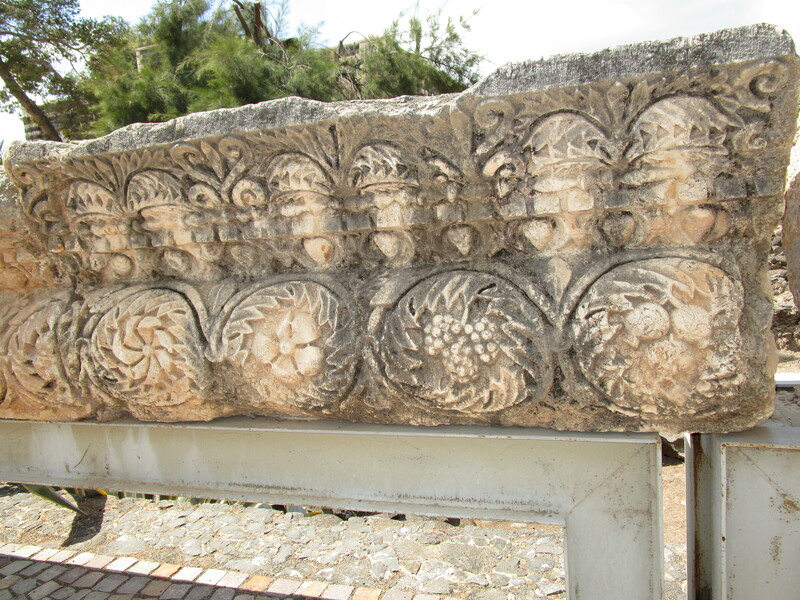 Many other Bible stories come from the city of Capernaum. 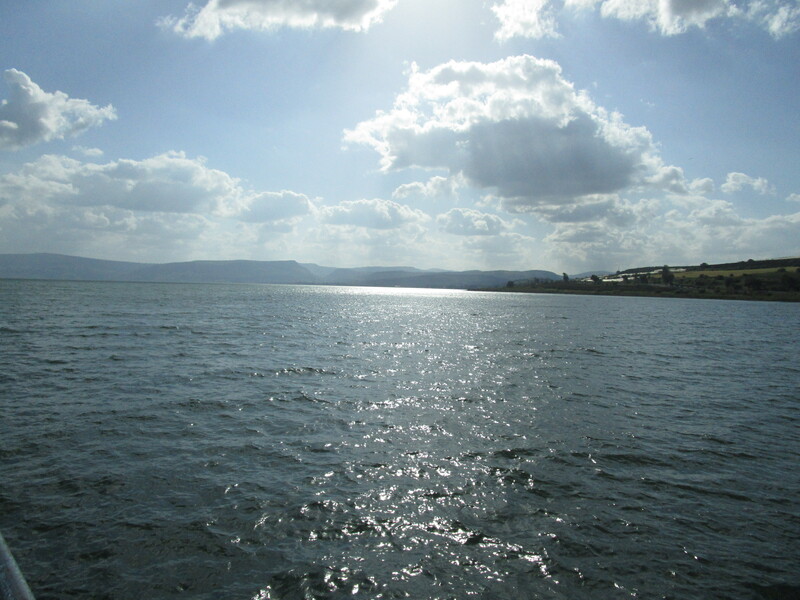 It is located on the shoreline of the north end of the Sea of Galilee. Standing inside the city, the sun shone on our faces, and I heard wind blowing through the trees and waves lapping on the shore. I could smell that peculiarly pleasant fishy scent that is so prevalent in seaside towns. It was windy and cool, but Tsvi told us in the summertime that it is so hot that it is impossible to remain outside for long. 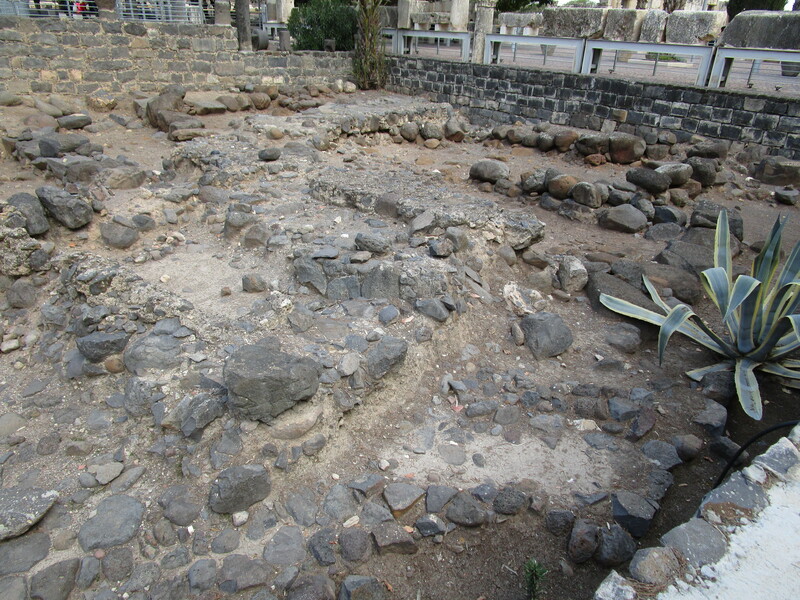 Remains of first-century homes in Capernaum. 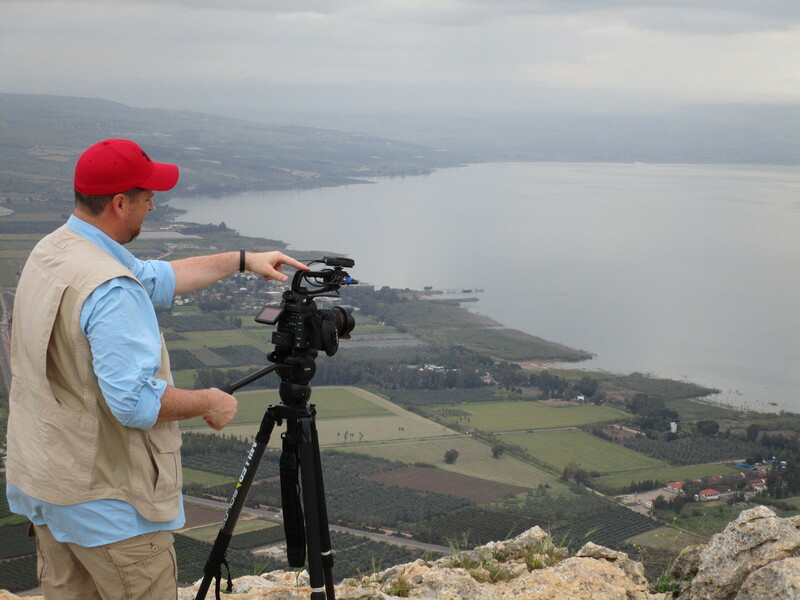 A fourth century synagogue is located here, and John began filming a lesson about Jesus’ ministry in Galilee. 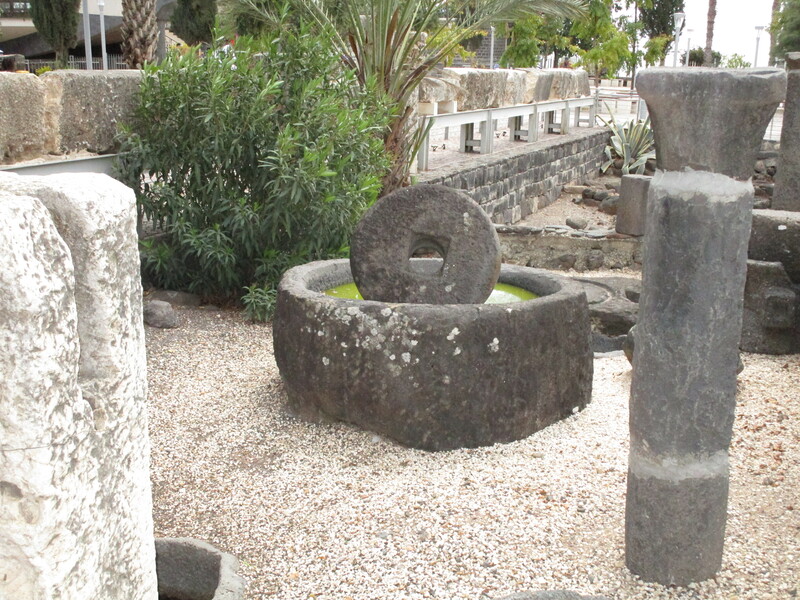 Archaeologists have excavated many millstones here, and while in Capernaum, Jesus taught about the importance of humility. “Whosoever receives one such child in my name receives me, but whoever causes one of these little ones who believe in me to sin, it would be better for him to have a great millstone fastened around his neck and to be drowned in the depth of the sea,” (Matthew 18:5). 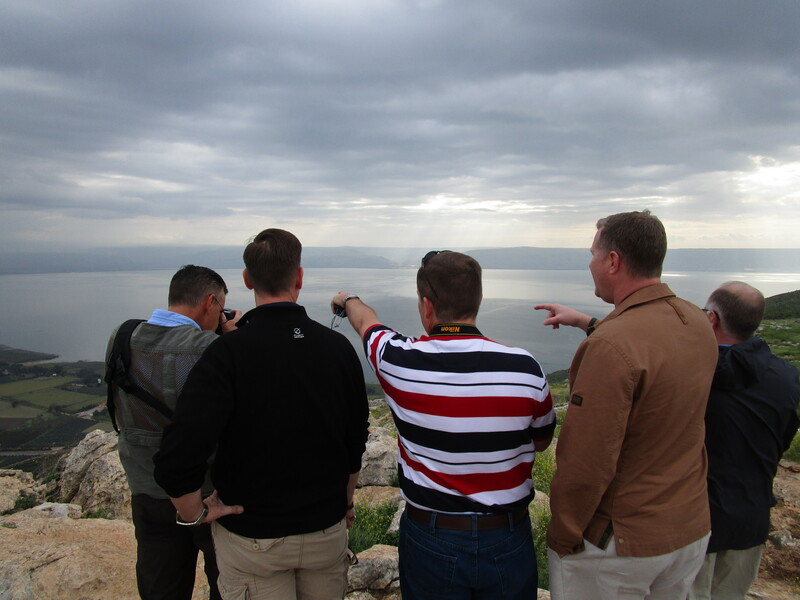 It was such a visual lesson to be just a hundred yards from the shore of the Sea of Galilee, and imagining Jesus gesturing to one of the millstones that lay nearby, and then to the Sea to illustrate the fate of one who caused a child to sin. We ate lunch at a Falafel stand, but I had chicken schnitzel – basically a fried chicken patty stuffed into fresh pita bread with lettuce, tomato, and some type of sauce. It was DELICIOUS! 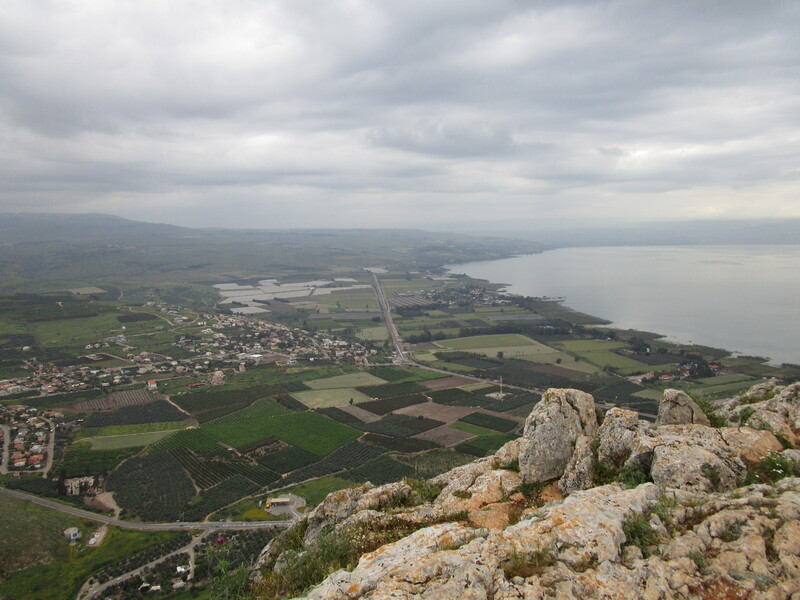 While we were there, we ran into a group that we had previously seen at our hotel in Caesarea, then again atop Mt. Carmel. 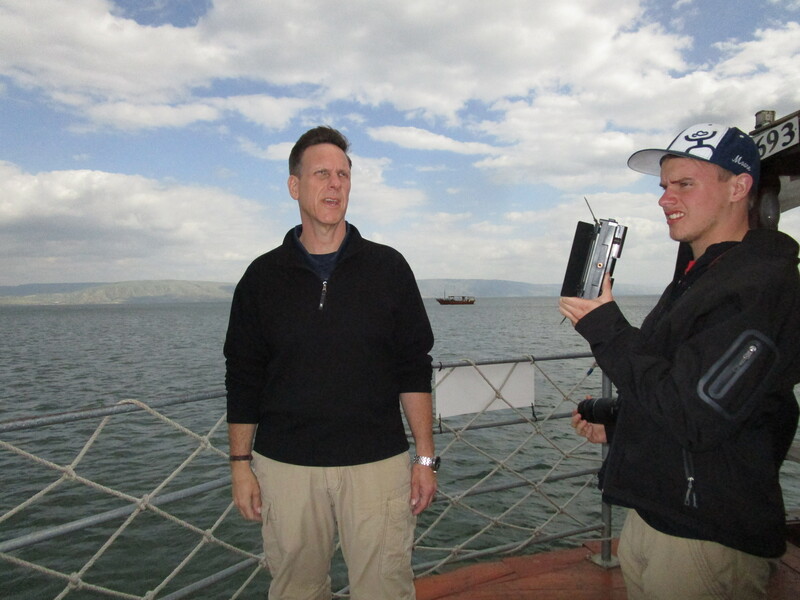 Jon introduced himself to one of the men and found out that he was an elder from a congregation in Tulsa. The whole group attended there and we have mutual friends – it’s such a small world! 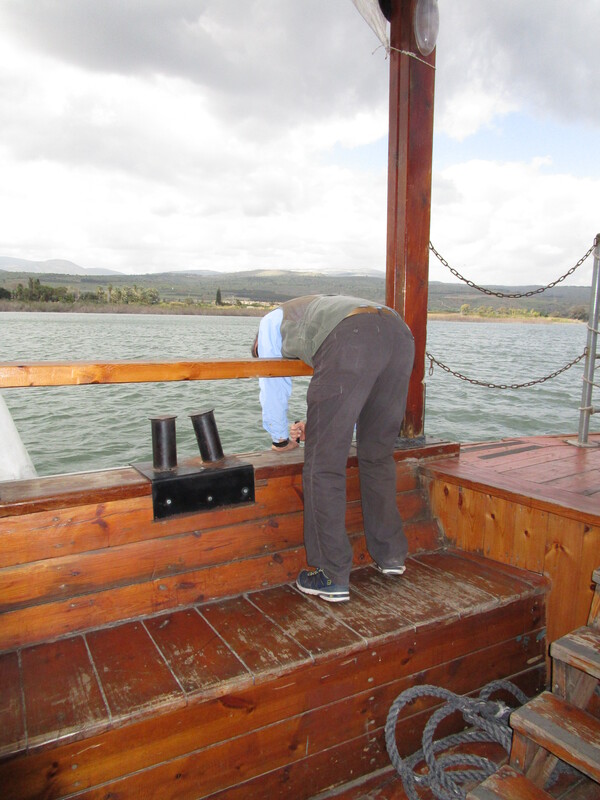 After lunch, we went and saw the “Jesus Boat” – of course they can’t know for sure it was one He rode in, but it’s from the first century and helps us to see what the fishermen used then. 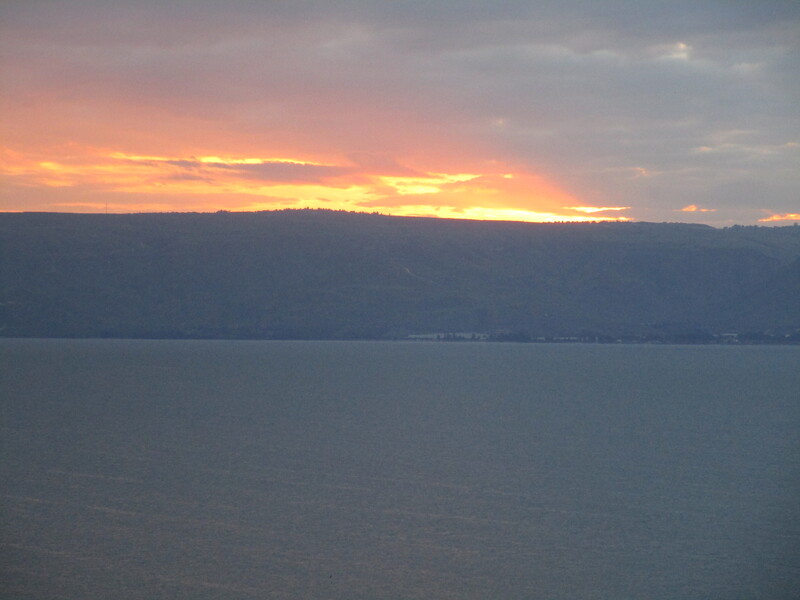 And from there, we boarded our boat on the Sea of Galilee. The water was a little choppy but the ride was quite smooth. 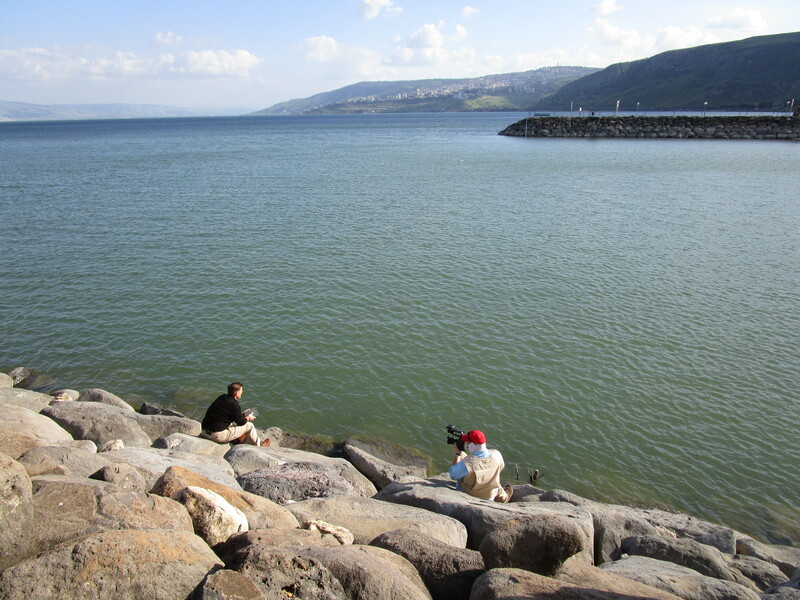 John continued filming his lesson here, and we sang and prayed together as a group. I got a better perspective on the size of this body of water. You can see from shoreline to shoreline on the narrow side, but not from end to end. 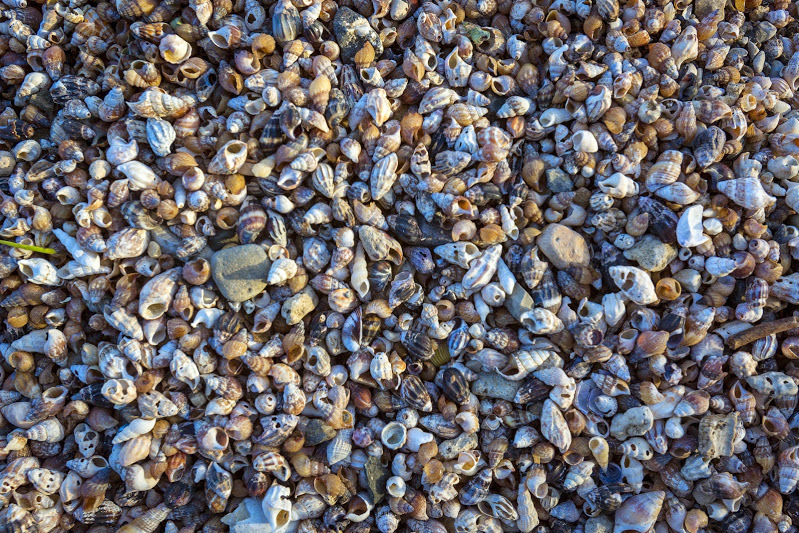 Tiny shells made up the shoreline in one area where John filmed. Gulls rose and seemed to float over it, looking for their next meal. Cool breezes blew in on us from the waves. 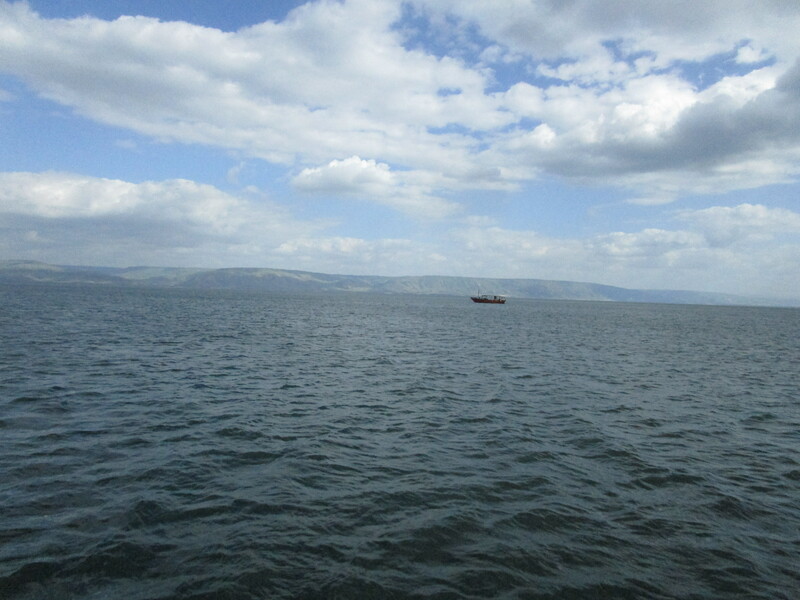 I just loved seeing the Sea that obviously meant so much to the Lord. It was such a huge part of His life. 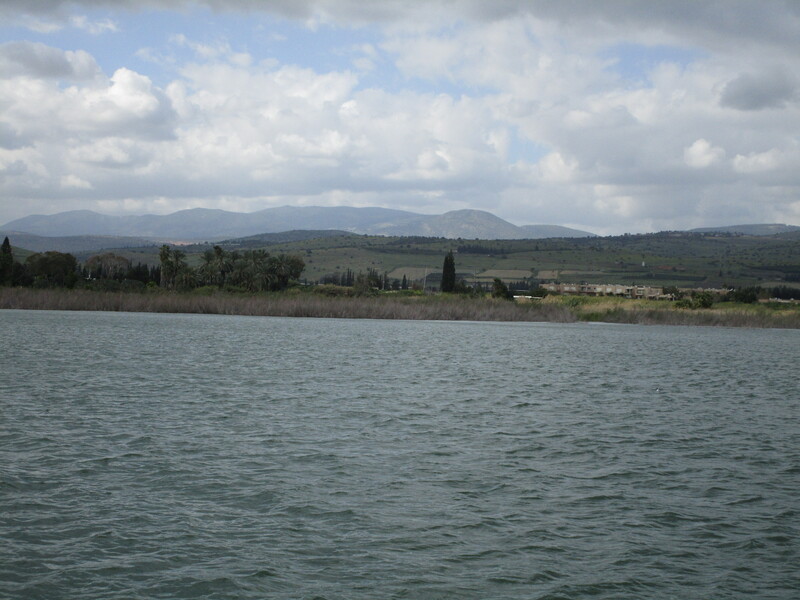 Several of His disciples worked on the Sea. He lived near the sea. He taught from the sea. 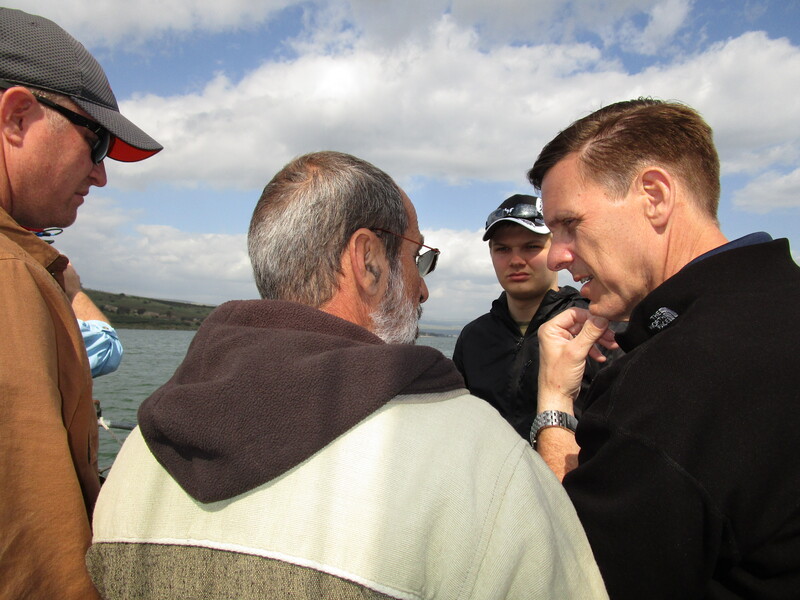 He ministered to people from the sea. He performed miracles on the sea. He appeared after His resurrection on the shoreline of the sea. 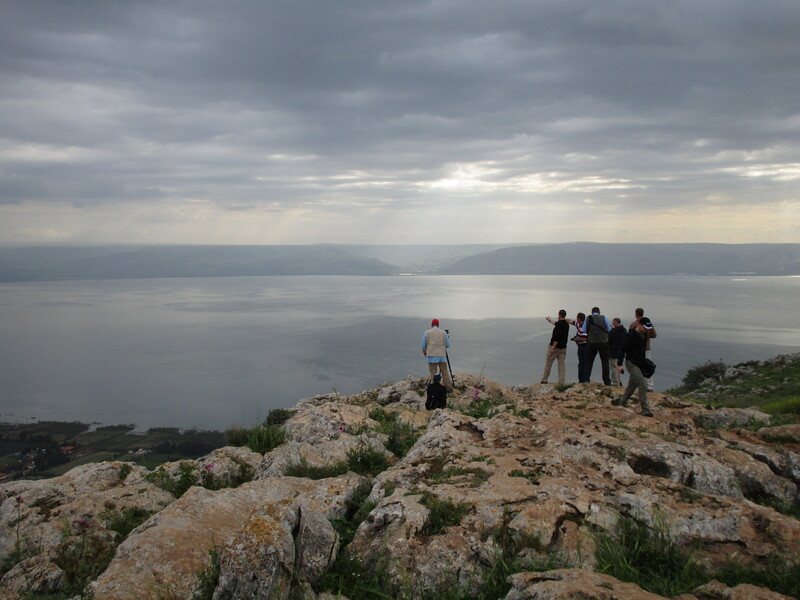 He walked on the waters of this sea. 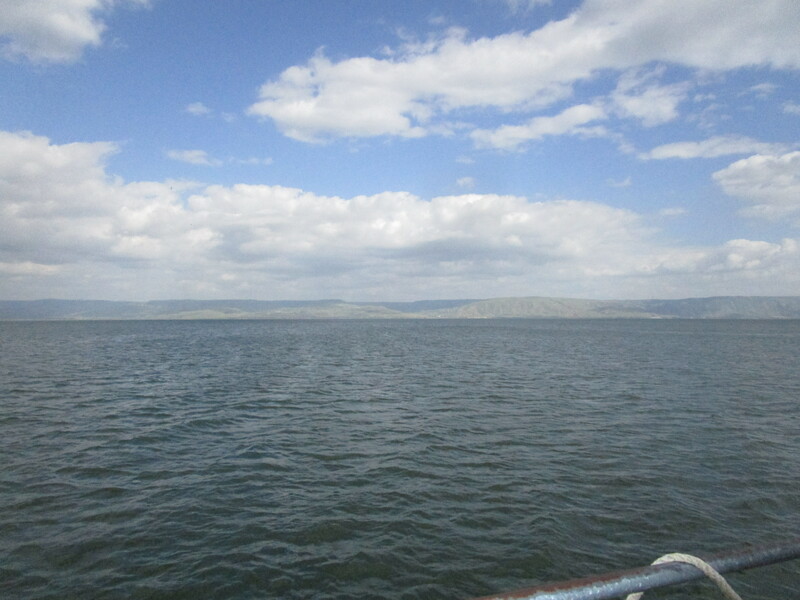 Looking out from the boat and seeing the distant mountains (from one of them He cast the demons out of the swine, and they ran headlong into the sea) and the cove where He likely spoke to the crowds, and just being on those waters was an experience I pray I’ll never forget. Mat capturing the beauty of another Sea. 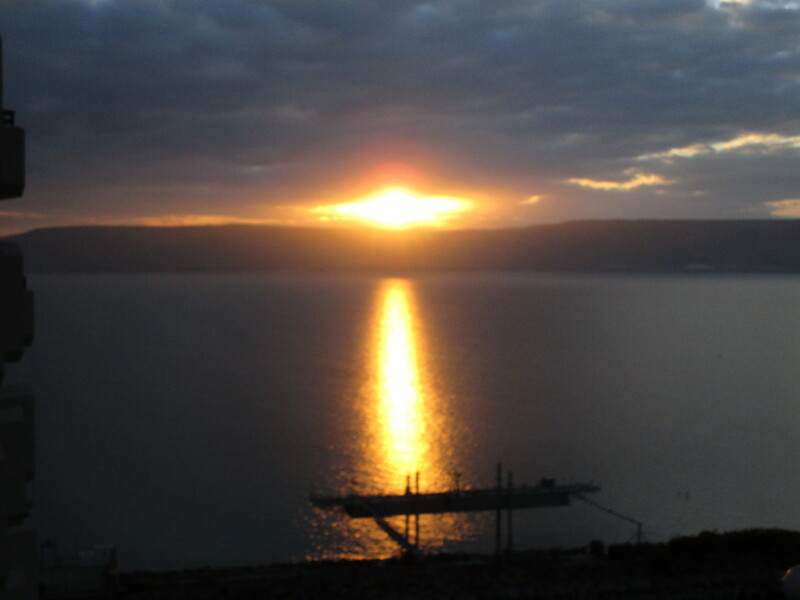 First the Mediterranean, now the Sea of Galilee – what’s next? Leaving there, we started to head back to the hotel at around 5:00. 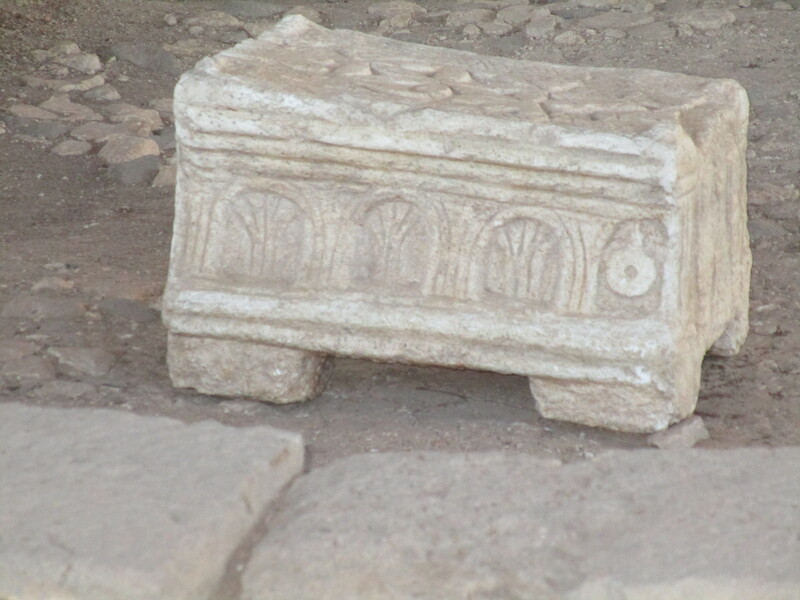 An impromptu stop was made at Magdala – of course Mary of Magdala’s hometown. 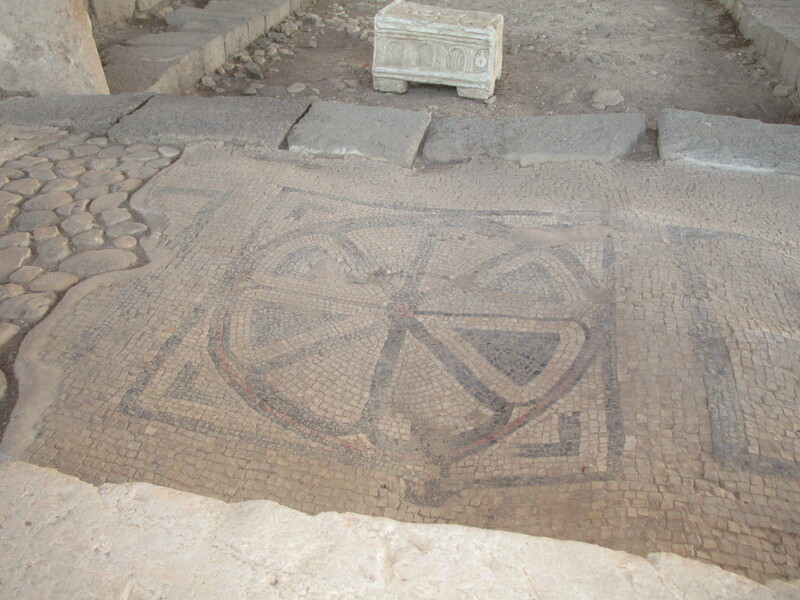 Very recent excavations in preparation for the building of a hotel have uncovered significant first-century finds, including a synagogue with beautiful mosaic floors, and the home of a seemingly wealthy individual. Our guide was from Mexico, and he was funny and interesting, and I loved his accent! 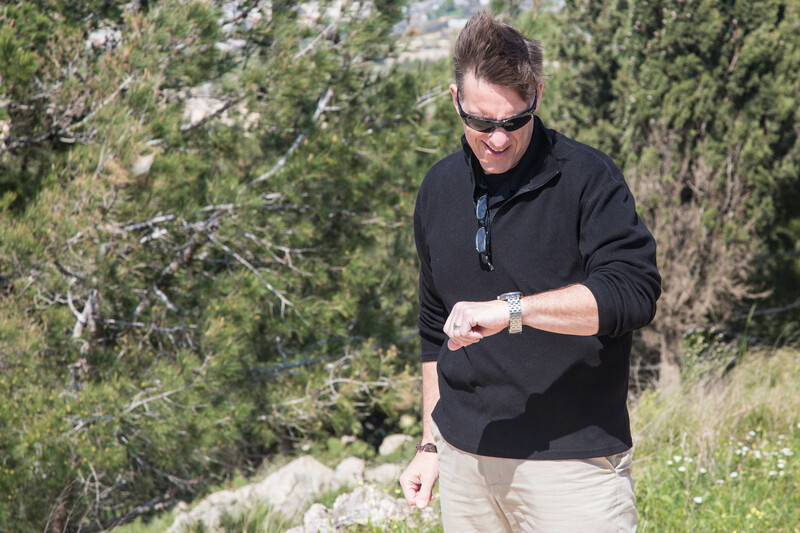 John, Rick, Gary and Jon were practically beside themselves with excitement over this find. I am not smart enough to understand how significant it is, and why, so you will have to wait for the video to see what they discovered. We left there around 6 p.m., and by now, most of us were badly needing food and rest. Anyone who knows John’s father, Grady, will especially appreciate this. The apple doesn’t fall far from the tree! John can’t seem to remember Tsvi’s OR Yossi’s names and how to pronounce them. He tries and tries, but just can’t do it. Tsvi has been called “Smee”, “Shmee”, “Psee”, and “Steve”, and Yossi is usually called “Yoshi”. Micah has reminded him that “Yoshi” is a Mario game character, but that just confuses him more. We have to laugh. Seasick?? Nope, just trying to get the perfect shot. I just ate my last Buffalo Wing pretzel. I’m not sure I’ll live for 3 more weeks without them. I’ll try. We all got a little sunburn and a LOT of leg workout today. John has been in major “GO” mode. When he’s in GO mode, he tends to be a little bit…bossy? 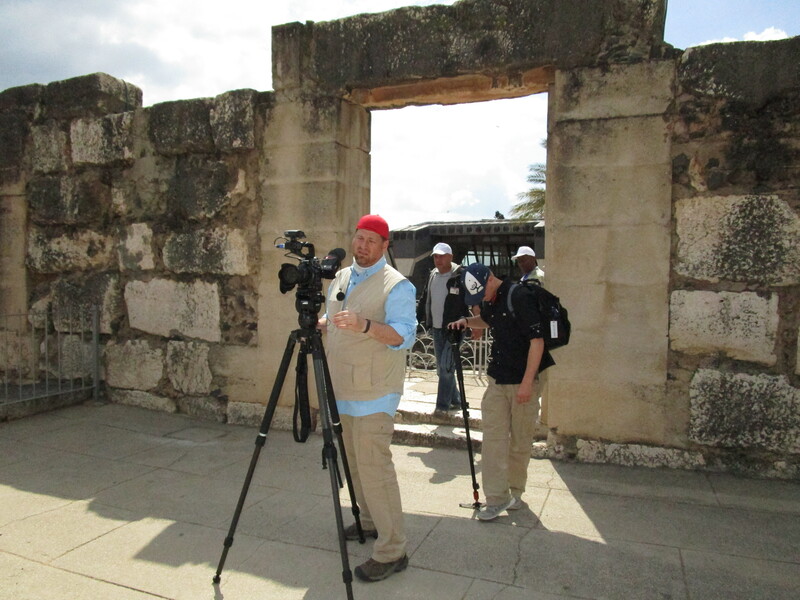 But he’s trying to make sure we stay on schedule and get the footage that we came for, and not waste time or the Lord’s money. 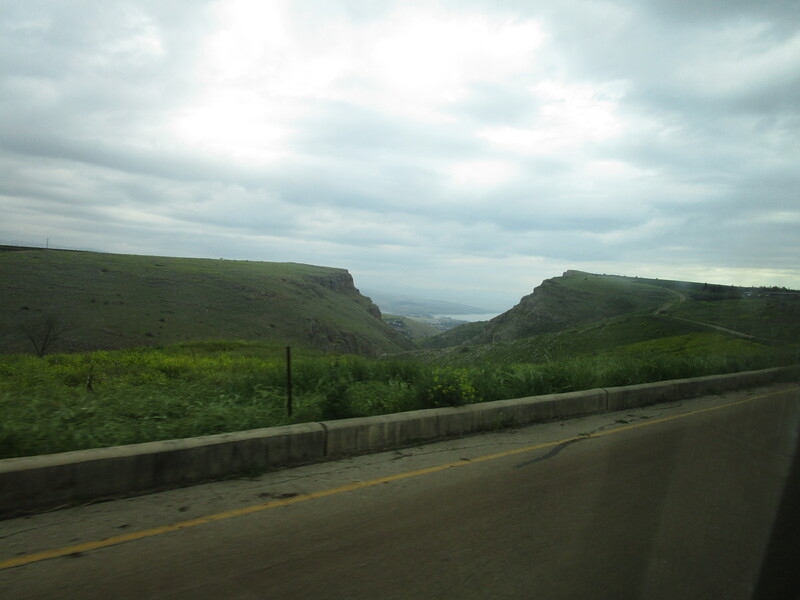 10:30 p.m. here…up tomorrow: Bethsaida, Dan, and Caesarea Philippi! Thank you for the prayers, please continue to pray for health, making good use of time, for us to be rested and refreshed. I know the guys are missing their families terribly. Continue to pray for our families at home! Next Lifeless Idols, or the Living God? Loving reading these each day! Starting to really look forward each day to reading your post. You really make it come alive for those of us back in the states – almost as if we were there ourselves! Thank you Carla. I also am looking forward to reading the daily post. You are doing a great job and I really feel like I am able to experience just a little of what you all are. What an incredible journey you are all on…thank you for sharing it, so well, with all of us! 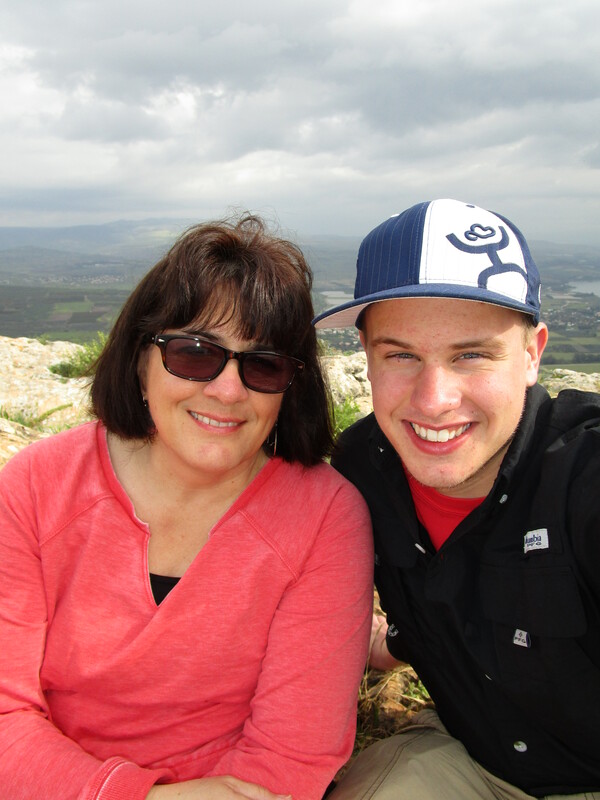 You have an amazing ability to paint such a great perspective of this trip! Thank you!!! You are probably jetlagged and tired but your efforts at these posts do not go unnoticed. You have been given true talent with the written word- those guys are blessed to have you with them and we are blessed by getting to see/hear/feel like we are all there with you. So proud of you all and the work you are doing. I am so envious of the sights you are seeing and the things you are learning. But, Carla, your blog is so very educational and loving history I am eating this all up. You are in our prayers and thoughts daily. May God continue to bless and keep each of you on your journey. 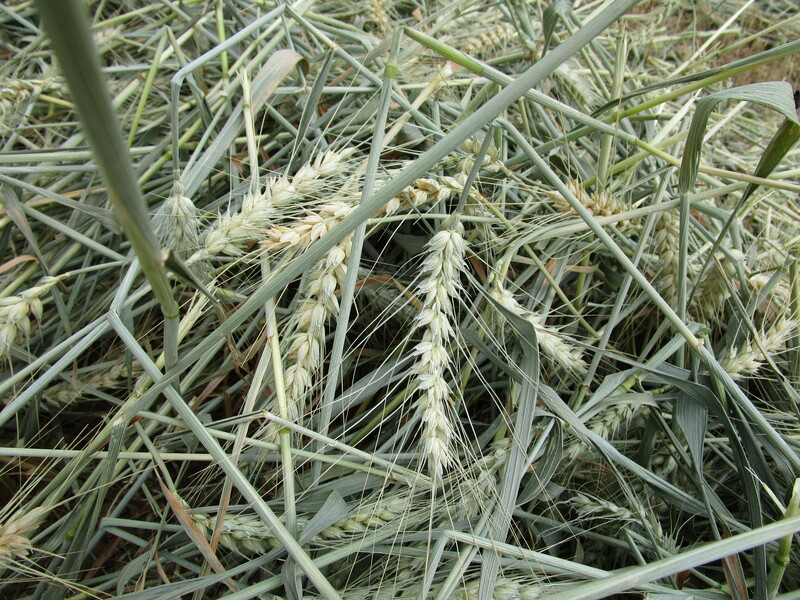 I just love those photos, they are so sharp and clear giving us the story of the land in pictures. You are doing a great work for the Lord. I pray continued blessing and success in your ministry.